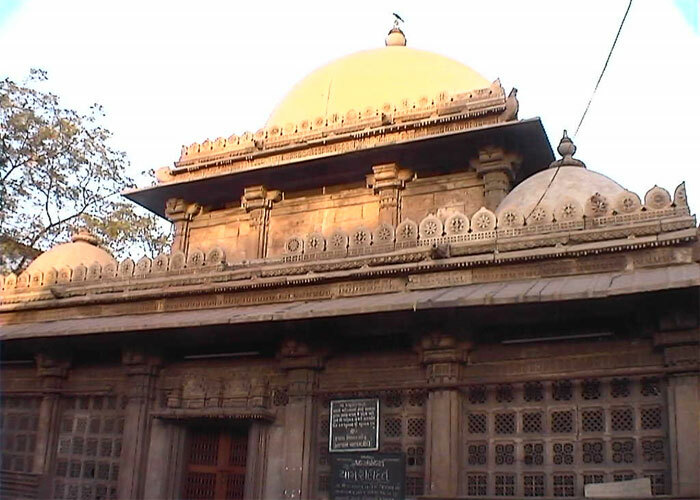 The Sidi Saiyyed Mosque, built in 1573, is one of the most famous mosques of Ahmedabad. As per the marble stone tablet fixed on the wall of the mosque, it was built by Sidi Saeed (aka Sidi Saiyyed) an Abyssinian in the retinue of Bilal Jhajar Khan, General in the army of the last Sultan Shams-ud-Din Muzaffar Shah III of Gujarat Sultanate The mosque was built in the last year of the Sultanate of Gujrat. The mosque is entirely arcuated and is famous for beautifully carved ten stone latticework windows (jalis) on the side and rear arches. 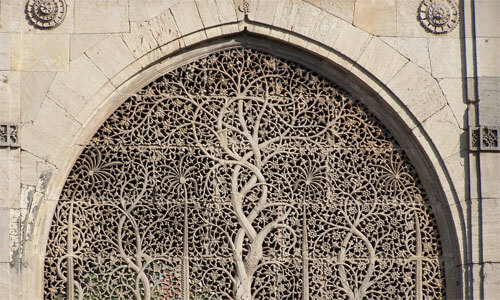 The rear wall is filled with square stone pierced panels in geometrical designs. The two bays flanking the central aisle have reticulated stone slabs carved in designs of intertwined trees and foliage and a palm motif. 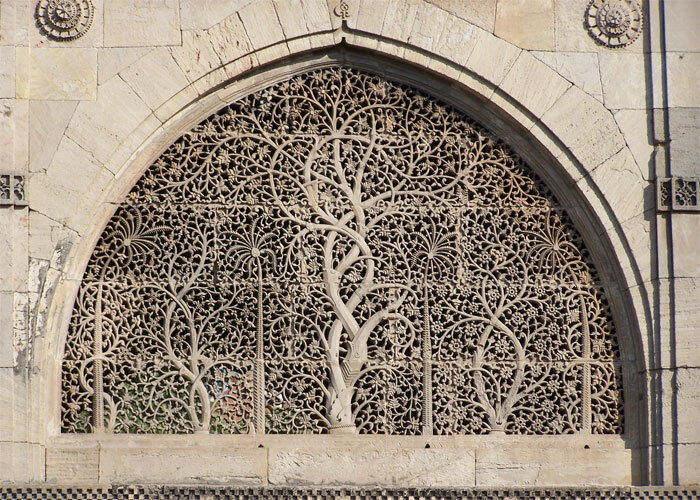 This intricately carved stone window is called the Siddi Sayyed Jali. 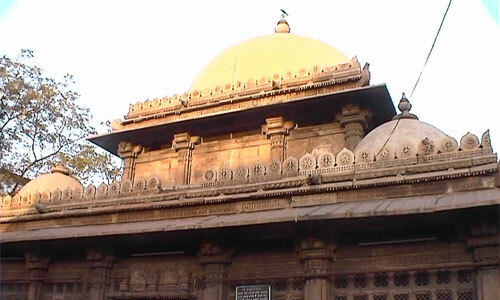 Siddi Sayyed Jali is unofficial symbol of city of Ahmedabad and inspired the design of the logo of the Indian Institute of Management Ahmedabad. Lying opposite to Mahatma Gandhi Road, on the eastern side of Teen Darwaza, Jama Masjid is one of the most splendid mosques of India. Constructed in the year 1423 A.D, the Ahmedabad Jama Masjid was established by Sultan Ahmed Shah, the founder of the Ahmedabad city. 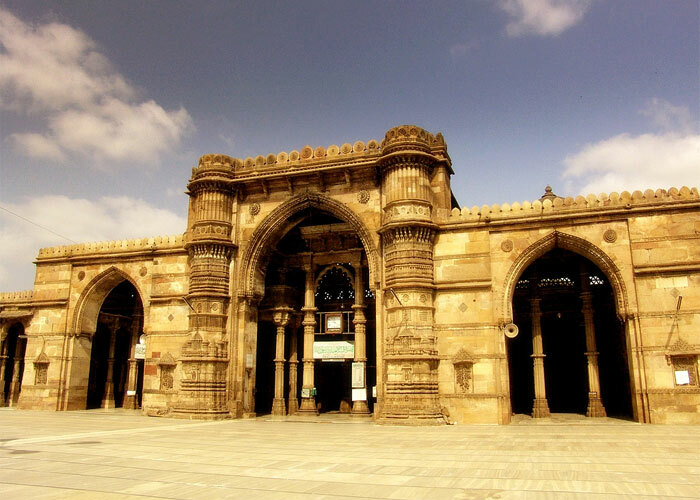 Supported by 260 pillars, the Jama Masjid of Ahmedabad consists of 15 domes. Jama Masjid lies in the heart of the old city. Though it's a heritage monument, the mosque is still in active use. Incongrous loud speakers are clamped to the minarets and inside, large fans are mounted onto the walls. A garish clock with a bright red LED display showed the time. 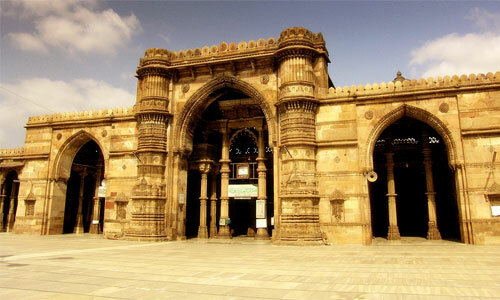 The mosque was commissioned to be built in 1514 AD by Rani Sipri, hence the name of the mosque. She was one of the Hindu Queens of Sultan Mehmud Begada. Their son was executed by the Sultan for a minor misdemeanour. He lies buried in the tomb in front of the mosque. Due it's intricately carved decorations it also known as the Masjid-e-Nagira - Jewel among Mosques.